The Legend Hotel is located in a 5-floor tenement building with modern necessities, such as a lift and air conditioning. Rooms have city views, and the breakfast is rumored to be the best breakfast in Krakow. 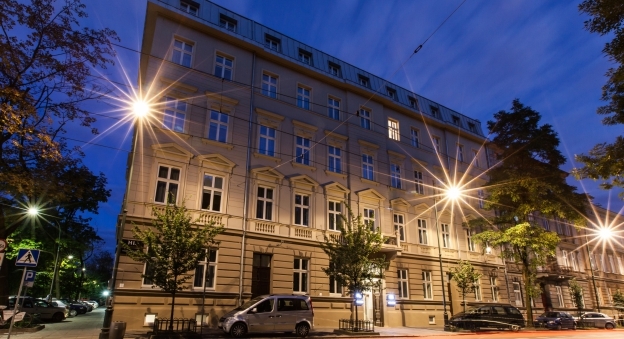 Situated at Gertrudy 12, the Legend Hotel offers a little over a 5-minute walk to the Wawel Royal Castle and a mere 10-minute walk to the Cloth Hall in the Krakow Main Market Square. The guests of Legend Hotel are offered a breakfast buffet from 7 am to 10 am. The Bistro Beta is the hotel’s restaurant, where unique elements of the old tenement building were use in the design. The restaurant specialises in dishes made from local produce. .
All rooms have free WiFi, satellite TV, a tea and coffee set, work area with radio, and an individually controlled air conditioning and heating. Bathrooms have showers, hair dryers, fresh towels, and designer toiletries. Daily housekeeping will replenish the complimentary bottled water in your room. The Legend Hotel offers concierge services, dry cleaning/laundry service, and luggage storage.